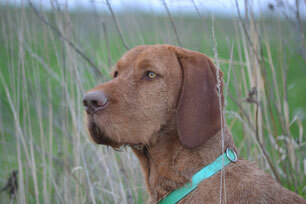 Gambit was our first WHV from Konza Vadasz in Kansas. He became ours in 2011 He is incredibly loving and is a great dog. He loves napping in the sun and playing frisbee. CH Zoldmali Fanni CA aka Quill was added to our family in 2015. She is truly the best dog! She is goofy, cuddly, driven and obedient. We are so excited for her show success. We are continually working on her hunting skills. Update 2018: Quill placed Best of Opposite at Westminster Dog Show! Delceg became part of our kennel and family March 2018. Delceg came from Zoldmali Kennels where he was raised and trained by Zsofia Miczek. 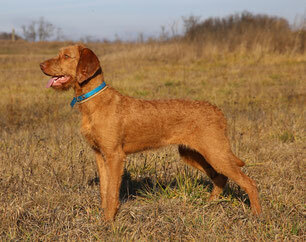 He gained the titles of Hungarian Hunting Champion and Junior Champion with Zsofi at the helm. We plan on continuing hunting and showing him here. 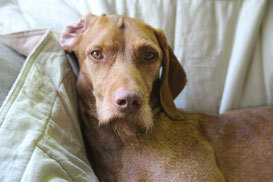 Delceg is a friendly, affectionate and goofy boy. He wants to work and please us, He is truly a wonderful dog! Kolibri joined our family and kennel in March 2018 (along with Delceg). She was also raised and trained by Zsofia Miczek. With her she gained her Hungarian Junior Hunting Chamption title. Kolibri is was born 5/13/2017 and is still is a puppy at heart. She is incredibly sweet and mellow at home. But once she is excited, alert, and confident when she gets out in the field to work. 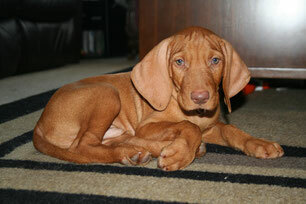 Why did we want to breed wirehaired vizsla? They are a beautiful, smart, loving dog. 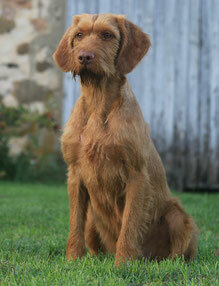 We want to continue wirehaired vizsla stately pedigrees and temperaments. 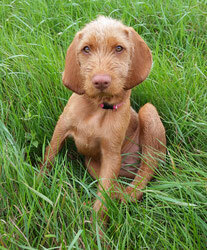 We want to breed for health, temperament, hunting and conformation ability. All of our dogs are eyes and hips are checked. They are certified free from hip displysia through the OFA (Orthopedic Foundation for Animals) and screened for hereditary diseases before we breed them. 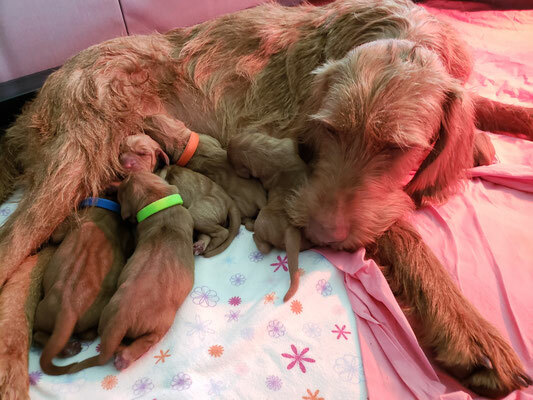 Like our dogs, the litter will be registered through the AKC. 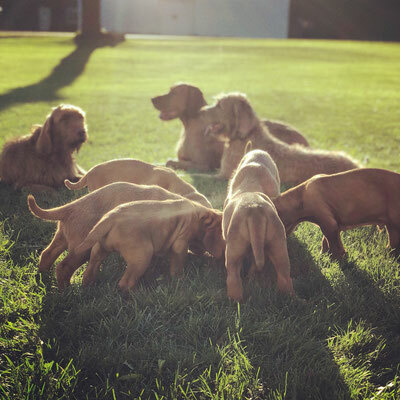 Puppies Health: The puppies will have their tails docked and front dew claws removed following the WVCA standards. Want a puppy? 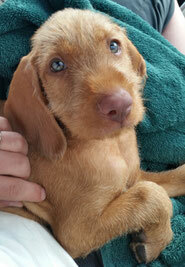 First thing for you to know is we screen our puppy buyers and everyone will get a puppy contract. We want to make sure our buyers understand all that comes with getting a WHV. If you are interested in a WHV for showing, hunting, agility, dock diving or just as an awesome family dog, we have two documents for you. The first document has more information for you to read about our breeding and specifics on puppies, litters and our process and contract specifics. The second document is our Perspective Puppy Questionnaire. This helps us get a better idea of who you are and why you want a WHV. Filling out the questionnaire is a great first step. We would still have a phone or email conversations to follow up the questionnaire. We just want to make sure our puppies go to great homes. Feel free to contact us with any questions! This contains more indepth information on Breeding Philosophy, Puppy Health, Spaying/Neutering, and Other Topics. To be filled out if you are interested in getting a puppy. We plan on breeding one or both girls this fall or winter. Quill will most likely go into heat around OCT 2019. Kolibri we aren't sure but would plan on breeding her as well.